Puerto Vallarta, Mexico (February 17, 2010) – Who said the kids’ spring break can’t be relaxing? The AAA Five-Diamond Grand Velas Resort Riviera Nayarit introduces an all-inclusive Family Spa Package that gives kids and parents alike the perfect opportunity to take a relaxing break in Mexico. Mom and dad receive a 50-minute holistic massage at the 16,500 sq ft Grand Velas Spa, a member of The Leading Spas of the World. Children (ages 4-16) get a choice of one 25-minute treatment from the Kids Spa Menu which includes a chocolate facial, princess or bubbles massage and others. Kids’ treatments take place at the beach spa cabana or in suite accompanied by a parent In addition, children and teens up to 16 years of age stay and eat for free. The Grand Velas’ all-inclusive rate includes suite accommodations, meals, premium branded beverages, 24 hr in-suite service, fitness center, kids’ club, activities for adults and children, taxes and gratuities and more. The Family Spa package is valid through April 30th with rates starting at $454 per person, per night, based on double occupancy. 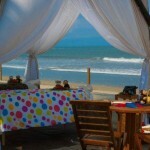 For more information and reservations, please visit www.grandvelas.com or call 1-888-261-8436. The resort’s sister property, Velas Vallarta Suite Resort in Puerto Vallarta, offers an all-inclusive Family Package that highlights a complimentary upgrade from a studio suite to a one-bedroom ocean view suite with terrace. The package also includes tickets to the Aquaventuras Water Park, a $100 spa credit per room and the resorts deluxe all-inclusive amenities. Children under the age of 12 stay and eat for free. The package is valid through April 11th with rates starting at $210 per person per night, based on double occupancy. 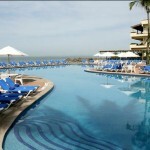 For more information and reservations, please visit www.velasvallarta.com or call 1-866-847-4609. In Nuevo Vallarta, Riviera Nayarit, Mexico, Grand Velas All Suites & Spa Resort is a member of The Leading Hotels of the World. Located just 15 minutes north of Puerto Vallarta on Banderas Bay, Grand Velas features 267 ocean-view suites, ultra spacious Spa Suites and two- and three-bedroom Imperial Suites. Grand Velas Spa is the crown jewel of the resort and a member of Leading Spas of the World. The spa features 20 treatment rooms, over 80 spa treatments, a high-performance gym and exercise room, spa boutique and a beauty salon. Five restaurants, three of which are gourmet, feature stylish decor and a la carte choices for French, Italian or Mexican cuisine. The resort also offers tiered three-temperature infinity pools with iPod minis, tennis court, 25,321 total sq feet of meeting space, special entertainment for adults and kids and a Kids Club. Located on 10 acres of oceanfront in Puerto Vallarta, Mexico, Velas Vallarta Suite Resort & Convention Center is walking distance from Marina Vallarta Golf Course and just minutes from Downtown Puerto Vallarta’s captivating attractions, activities and landmarks. Situated on the emerald waters of Banderas Bay, Velas Vallarta features a high-tech Convention Center, three swimming pools, a rejuvenating spa, fitness center, multiple restaurants, an inviting lounge, live music and entertainment, and breathtaking views of the surrounding Mexican Riviera. The family-friendly resort also offers a basketball and tennis court and special entertainment for adults and kids. VALENTINE’S MONTH AT HACIENDA XCANATUN – SAVE 30% ON 3 NIGHT ROMANCE PKG.